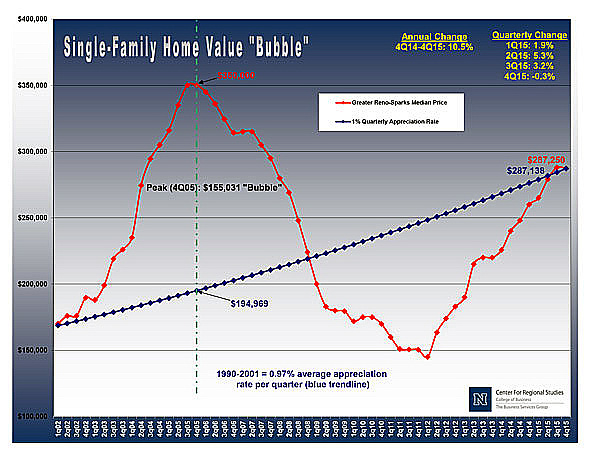 I have told many clients, my first 30 years in Reno (1970-2000) Real Estate equity goes up 4% per year- STILL TRUE! Per notation on University of Nevada Reno Chart below - The average appreciation rate from 1990 to 2001, was at .97 percent per quarter (about 4% per year). The surprise is - Using that same percentage and plotting median price from the first quarter of 2002 to the fourth quarter of 2015 (the Roller Coaster Years), our housing prices are almost exactly where they should be. 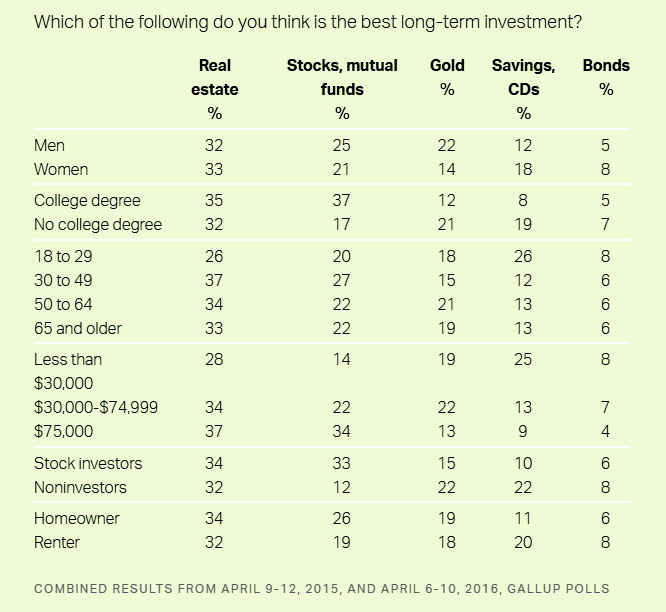 Per Gallup Poll - More Americans Say Real Estate Is Best Long-Term Investment. 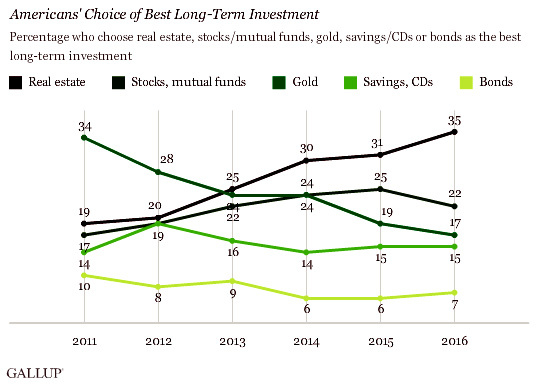 35% of Americans now say real estate is best long-term investment. Stocks (22%) and gold (17%) fall further behind as top choice. Age, income, education, gender all related to views of best investment. The average sale price of new homes in the U.S. increased from $259,300 in August 2011 to $348,900 in February of this year, the percentage of Americans picking real estate as the best long-term investment almost doubled. During approximately the same time span -- from August 2011 to April of this year -- gold prices plunged from $1,910 to $1,254 per ounce, and the percentage thinking gold would be the best investment was cut in half. Both the housing market and the stock market have recovered from catastrophic losses suffered in the last decade, with average house prices and the Dow well above their pre-crash high marks. But Americans have been much more likely to regain confidence in real estate than in stocks as "the best" long-term place to invest their money. The split between the two investment options grew again in the last year as the stock market's volatility increased investors' concerns. With housing prices showing a steadier path upward in recent months, even stock investors are about as likely in the April 2016 poll to choose real estate (37%) as stocks (32%) as the best long-term investment. The growing gap between stocks and real estate, and the continued rise of the latter as the preferred choice for long-term investments, may simply be a return to the norm. In a 2002 Gallup poll that did not include gold as a choice, 50% named real estate as the best long-term investment, compared with only 18% for stocks, 16% for savings accounts and 13% for bonds.